ALLEN's GATE CBT is a Computer Based Test (CBT) that will be done on a computer at an approved testing center in exactly similar way as that of the actual GATE exam where students sit in front of a computer and the questions are presented on the monitor. It will be conducted in more than 90 cities across the country for all the engineering streams i.e. Computer Science & Information Technology, Electronics & Communication Engineering,Electrical Engineering, Civil Engineering and Mechanical Engineering. 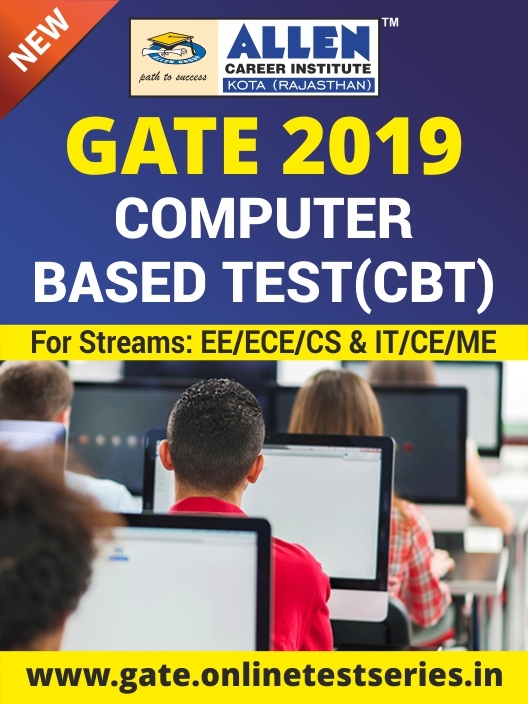 CBT Mock Tests for GATE 2019 will facilitate GATE aspirants topractice right in a simulating environment so that they get familiar with an actual online GATE exam, overcome exam fear and compete confidently with the nationwide quality students who are preparing well for the GATE examination. Simulation of Actual Exam: Students will get similar interface for grand mock GATE CBT exam to familiarize them with the computer based testing tools and the type of questions they are likely to face in actual entrance examinations. In-depth Self Assessment: Student will geta multidimensional performance analysis subject-wise/topic-wise/question-wise,which has been designed to bring forth the learning gaps and guiding student at a time. Ranking & Analysis on national level: Get All India Rank on GATE mock exam and comparative analysis with topper that helps students to know their preparation and identify where they are lagging behind. Eliminate Exam Fear Factor: GATE aspirants can easily avoid their fear factor by giving exam in similar examination settings before appearing to the GATE 2019.